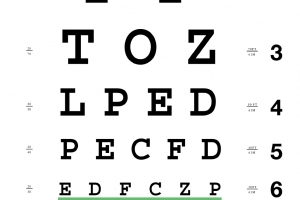 It’s arguably the most recognizable visual (excuse the pun) in the field of optometry and ophthalmology – the Snellen chart. So, it’s only fitting that we recognize founder Herman Snellen today, on the anniversary his death today in 1908. Dutch ophthalmologist Snellen developed the chart in 1862 to measure visual acuity. Snellen also devised the system of rating vision as a ratio (i.e. 20/20). Snellen left us with an impressive body of work regarding his studies on astigmatismus, glaucoma, inflammation, diseases of the retina and connective tissue. In addition, Snellen improved and invented a number of surgical procedures, including those for entropion, ectropion, and trichiasis. Despite all of his accomplishments and contributions, he is still best known for the visual acuity chart that bears his name. According to The Seattle Times, more copies of the Snellen chart have been sold in the United States that any other poster. Thank you Dr. Snellen, for this chart, that is still a staple in medical offices across the globe. Today, we honor you.